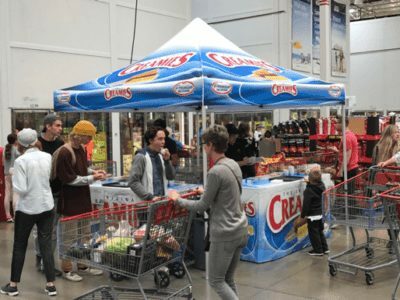 Every summer from May until August we have Creamies tents at every Costco in the state of Utah. If you have never tried Creamies or you have, this will be a great opportunity for all people to try our delicious, healthy ice cream bars for free. You’ll be happy you did because we make the best ice cream bars. At these events, you will typically find our Original and frozen yogurt bars. Only 120 calories our originals include chocolate, orange, and banana-we have been making them for decades. Our frozen yogurt bars include raspberry, chocolate, and peach. The frozen yogurt bars are healthy, and only 102 calories. If you are at Costco and looking for a tasty treat you will love our Creamies ice cream bars.